Conductors, like policemen, are getting younger. I have about three decades’ start on Andrew Gourlay who, tonight, was back conducting an orchestra in which he played trombone in his twenties. The BBC Philharmonic Orchestra has a reputation for being ‘adventurous and creative’, but tonight they presented a programme of crowd-pleasers. That has its pitfalls as well as its benefits. There’s nothing wrong with presenting well-tried favourites and pieces that are easy to listen to, but they have to be done well. Gourlay on the podium is the proverbial safe pair of hands. 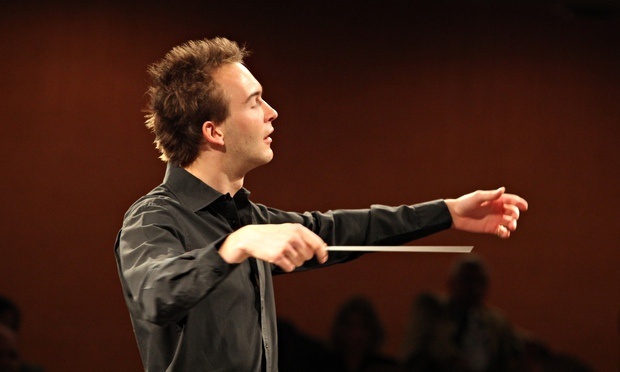 His conducting style is plainly directorial and his control is obvious to see. The first sign of this control over the orchestra’s musical interpretation came with the opening theme of the Tchaikovsky. It surprised me by its relaxed pace, the slowness giving the chance to appreciate the value of the pauses in the music. The orchestra had my attention from then on and held it all the way through the four movements. I’ve lost count of the times I have listened to recordings of the Serenade, but always I find myself – at the fourth – chuckling and saying “This is so darned Russian!” Well, of course it is, that’s what ‘Tema Russo’ means! The movement is based on two Russian folk-songs, the first with the character of a work-song or shanty, the second lively, almost like a gopak. And for me that summed up the mood of the evening – dance. The whole programme, from the ‘Waltz’ of the Serenade’s second movement to the exuberance of the 7th Symphony’s final movement, seemed to be up-beat and celebratory. Arguably Johan Nepomuk Hummel has one foot planted firmly in the 18c and the other stepping only lightly into the 19c. His ‘post-Classical’ style of composition could be seen as a bridge between the Classical and Romantic eras. He was a pupil of Mozart, Salieri, and Haydn, Haydn’s successor as Konzertmeister to Prince Esterházy, and had a long and stormy friendship with Beethoven. His music is not as widely known today as it ought to be, and his Trumpet Concerto in E Flat, composed in 1803, is as good a way of getting to know him as any. 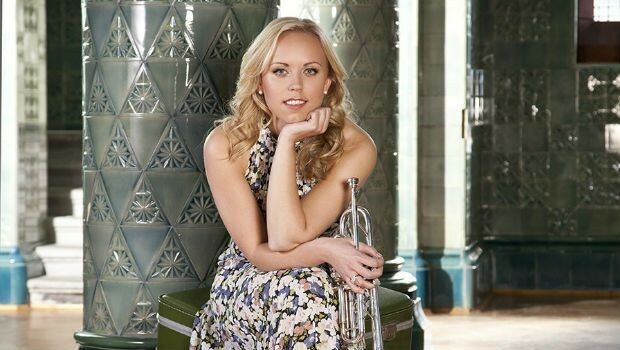 The soloist in tonight’s performance was twenty-six-year-old Norwegian trumpeter Tine Thing Helseth. The Concerto is a piece she has recorded, and I can recommend her recording. She has the benefit of a modern valve trumpet, which was unavailable at the time the concerto was composed, being probably scored for Anton Weidlinger’s new (at the time) keyed trumpet. After the orchestral introduction to the first movement, the trumpet enters like a wake-up call, but to my surprise Helseth actually had a couple of hesitant notes in her entrance. She recovered brilliantly, however, and made the trumpet ring like a bell for the rest of her performance. I would recommend both listening to the concerto, along with anything else you can find by Hummel, and catching any performance by Helseth that you can find at a concert hall near you! I suggested that Hummel’s music marked a bridging point between the Classical and Romantic periods. When you consider that Beethoven’s 7th Symphony was composed a mere ten years after Hummel’s Trumpet Concerto, it is obvious that a heck of a lot had been going on in music in that decade. It is not surprising that the reputation of Hummel as a composer should have become obscured until his more recent rediscovery and re-appraisal. Beethoven wrote his 3rd Symphony, the Eroica, in 1804, for example, barely a year after, and the 6th, the Pastoral, in 1808. By the time the 7th was completed in 1812 it’s obvious that we’re in a different musical world and have been for some time. This symphony has been called ‘the apotheosis of rhythm’, and to my mind its inclusion in tonight’s programme furthered the celebratory, dancing theme of the evening. Under Andrew Gourlay’s baton, the orchestra’s delivery of the 7th was faultless, and as crisp as a newly-minted fiver. It was impossible to fault it. I have adored the second movement since the first time I heard it. It is Beethoven in his ‘less is more’ mode, and the simple rondo theme on which the variations are based is relentless, repeated in shade after dramatic shade throughout the orchestra, punctuated be a couple of brief periods of repose and solace introduced by the clarinet. The final movement is explosive and frenetic, and when the coda was accomplished the evening’s celebration was complete. Despite the programme of easy winners, this was concert was a success. Recommended: any future concerts by the BBC Phil, or with Gourlay on the podium, or with Helseth as a soloist.